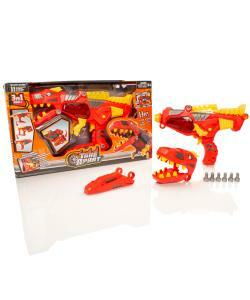 Awesome 3 in 1 Dino Blaster by Take Apart®; transforms from a Dinosaur into 2 different Blaster style guns. Build a fearsome 42cm T-Rex Dino, then transform into 1 of 2 blaster guns using the included screwdriver (stored in the dino's mouth). This Dino Blaster set includes 13 pieces and 3 x AA Batteries to power the cool lights and sounds for added effect. 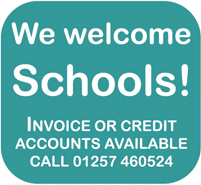 The process is challenging without being too difficult to complete for your child. Helps to improve hand-eye coordination, fine motor skills and problem solving. This fun build and take apart toy is made from non-toxic, recyclable ABS Plastic providing a safe toy for children to enjoy. The Take Apart 3 in 1 Dinobot Blaster set is the perfect construction toy for any child over 3 years old. The assembly requires elementary level of focus to promote the development of your child's attention span, hand-eye coordination, memory, and problem solving skill sets. This build your own construction kit comes in a superb looking box. The T-Rex Dino size is: 42cm x 22cm x 7cm. Made of non-toxic and durable ABS plastics with soft edges and curves to ensure long lasting performance and the safety of your child. Batteries included.